The nongovernmental organization Center of Visual Projects is planning to reproduce thirty architectural monuments and over a hundred secondary objects in the 3D format. Ten experienced designers and beginners from among Vinnytsia senior school pupils will be working gratis on mockups. 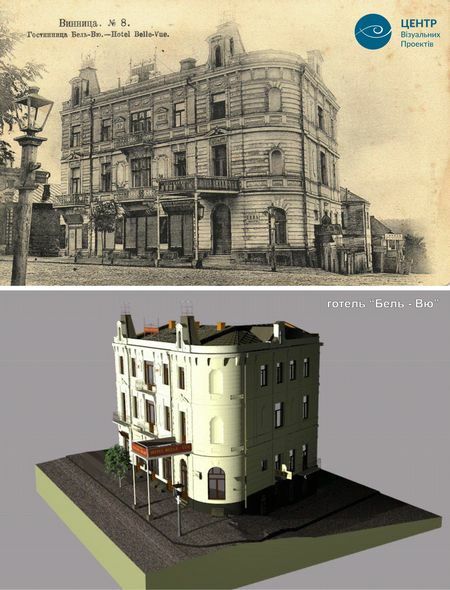 The main goal is to make an interactive map of the city’s historical part of the period of architect Hryhorii Artynov – from the former girls’ high school (now School No. 2) to the island of Kempa, from Kumbary to St. Nicholas’ Church in the Old Town. It will comprise both saved and destroyed objects. There will be free access to the whole content, including graphic images. The developers have already made trial mockups of the Tower – the city’s main symbol, – the ruined Belle-Vue hotel, and the railway station. Andrii adds they continue to gather information, photographs, and video files that depict the city’s historical objects. The developers are receiving help from historians, including Oleksandr Fedoryshen, director of the Vinnytsia History Center. But the main problem is that there is no technical documentation for the ruined monuments, which makes a full-fledged process of reproduction impossible. For example, the photo of the Belle-Vue hotel shows its facade only, while it is not exactly known how it looked from the sides or the back. For this reason, not only historians, but also architects and art experts work in the IT designers’ team. The active phase of work will begin in September and last for at least two years. The IT people are planning to present the finished visual product as an interactive 3D map which is likely to be displayed at the Vinnytsia City Hall for public view.